The event was well attended, with an eclectic audience drawn from Maryland, DC, and Virginia. Prior to the start of the formal component, the attendees had an opportunity to mingle and speak with the chief guest. Mr. Haqqani autographed copies of his latest book, Magnificent Delusions, for those who bought them. 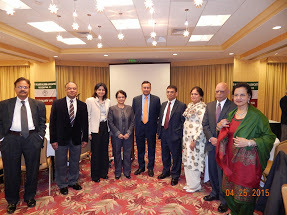 The guests were welcomed by the Association’s current president, Ms.Fazana Farooqi, who briefly related the achievements of AAA in its forty years of existence, including the Annual Mushaira, which has evolved into a revered institution in Washington DC, and the AAA’s signature scholarship program for needy students at AMU and other cities. 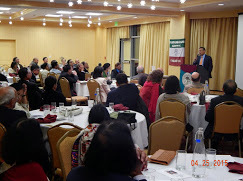 Mr. Haqqani was introduced by Dr Syed Amir and the session was moderated by Drs Mohammed Akbar and Razi Raziuddin, the Association’s secretary and chairman of the Board of Trustees respectively. 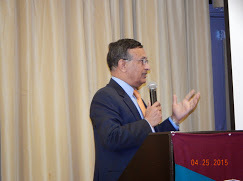 In his address, Mr. Haqqani emphasized the need for Muslims not to remain swaddled in the achievements of the past, missing the opportunity to acquire modern education that encourages independent thought rather than learning by rote. He argued that it was unrealistic to believe that, by continuing on our current path, we would one day rise to the top again as in the glory days of the mighty Moguls in India; the results of our flawed trajectory were already evident. While individuals among us have been successful, collectively the community has remained backward. He illustrated his reasoning by citing the example of the Mogul Empire. At its peak, during the reign of Emperor Akbar, it generated revenue of about 17 billion Pounds, which was approximately 25% of the world’s GDP at that time. Yet, the empire failed to invest capital in establishing institutions of higher learning or encouraging research-based knowledge acquisition, with unfortunate consequences. 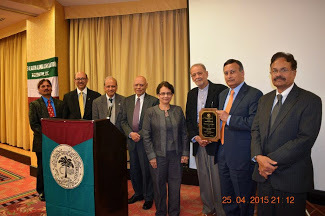 More pictures of the event can be seen by clicking here. Basant Mela: The AAA is collaborating with the Urdu Academy of Maryland is launching a Basant Mela on Sunday, May 31, 2015, at Bohrer Park Pond Pavilion, 506 South Frederick Avenue, Gaithersburg, MD 20877. Geared especially to appeal to young people, it promises to be a fun-filled afternoon for the whole family. Annual Picnic: The AAA is organizing its annual picnic on Saturday, June 13, 2015. More details will be forthcoming. Iftaar Fund Raiser: The annual Iftaar fund raiser is planned for Saturday, June 27, 2005. In the late forties, when I joined Aligarh University High School located in Minto Circle, India was slowly emerging from the bloody aftermath of independence and partition. Enrolment at both the University and the School had sharply declined. The University School was primarily a residential institution, and I found that one whole wing of the dorm was empty and shuttered. It gave an eerie feeling after dark. The school was enclosed by high walls, much like a medieval walled city, and the main gate was locked late in the evening. Students staying out late had to show a pass issued by the Warden, who was always on the premise, to the doorman to gain entry. Since the resident students were all underage, the regulations for staying out late were far more stringent than those applied to undergraduates living in the Universities halls of residences–Sir Syed Hall, Aftab Hall, VM Hall. Coming from a small town, Sahaswan in the District of Budaun (at the young age of 12) to join 9th grade, was a big change for me. With a population of only 22,000, Sahaswan was a peaceful little town, where nothing exciting had happened since the mutiny in 1857 when the British hanged several local rebel leaders by the trees and demolished a number of houses. Even the communal animosity of partition had passed it by. There was a single high school which did not offer any science courses, the reason that my father sent me to Aligarh. Three generations of my family had been practitioners of Eastern medicine (hakims), and my father wanted me to carry on the family tradition, especially as it seemed that Aligarh would imminently have a medical college. The environment at my new school could not have been more different than what I was used to. Most of the students came from rich landlord families who abounded around Aligarh. Also, at the time, South Africa was firmly in the grip of the apartheid regime and many rich South African Muslim businessmen with Indian heritage routinely sent their young children to the University School boarding house to be exposed to the old culture heritage. These boys spoke fluent English and dressed stylishly. In my first year, I felt intensely home sick, somewhat out of place, and nearly left the school to return to my hometown. However, in spite of its limitations, I had received an excellent education at our modest school in Sahaswan and could compete well with the students at Aligarh school. Our school Headmaster, Mr. Ehsan Haider, was trained in London and carried an aura of mystique around him. He was rarely seen out of his office. Students were called to his office only when he wanted to admonish them for some infraction or praise them if they had pleased him through success in sports or academic achievements. He lived not far from the school, had a European wife, and came to school riding a bicycle. A peon was always posted outside his office in the morning, ready to take the bicycle from him as soon as he dismounted. I fondly remember my outstanding Urdu teacher, Master Asghar Ali, who lived several miles away at Balaiy Qilla, walked both ways and was never late for his morning class. To me as a young boy, he looked old, but probably was only in his fifties. Often trainee students who were working for their Bachelor of Teaching degree in the nearby Teachers Training College came to teach our classes, as part of their hands-on training. We loved to give them a hard time, but some of them were clever and had learned the tricks of keeping order in their class. Although I had a rough time in my first six months at the University School, by the time I left two years later to join the University, I had fully adjusted to the environment and was sorry to leave after my high school graduation. I still look back to those years with nostalgia.